We start at WWDC. Apple shows us all the things they’re adding to iOS and OS X. Then, it’s up to our product teams to choose what would work well in our apps, determine what we have time for, and weigh that against other things we have in the works like Weird Feature X or a big upgrade. This summer we got a lot done! It’s easier to use, gorgeous, and starts cheaper than OmniPlan 2. Download a free trial or buy it from the Mac App Store. OmniPlan starts at just $149.99. Pro is an In-App Purchase for $149.99—or a separate purchase on our own store—and previous owners are eligible for a discount. We worked hard to accomplish the plans above by mid-September. And not only did our most recent set of updates fit in on the OS, they were featured by Apple as great examples. We love what Apple put into El Capitan, and we’ve nearly finished updating our apps to work well with it. OmniGraffle v6.4 is out now and adds Haptic Feedback when aligning objects. OmniOutliner v4.4 is coming within a week or so—watch our blog. OmniFocus v2.3 shipped two weeks ago, and OmniPlan 3 we talked about above! Split Screen and Slide Over are amazing for multitasking. Search directly from Spotlight for tasks, files, and text in files. For your Apple Watch? We rewrote everything to make OmniFocus a fast native app with support for placing an OmniFocus complication right on the watch face. On new iPhones you’ll also see Quick Actions on the app icon of each of our apps. 3D touch activates a set of shortcuts powered by recent activity in the app, and for document-based apps, allow you to quickly create a new document or task. There’s never been a better time to buy each of our universal iOS apps. The OmniFocus team has been on a tear lately: v2.2 shipped just before summer started, and v2.3, featured in the video above, arrived two weeks ago. With 2.3’s Custom Columns layout options, you can pick and choose what data you’d like to show, which Perspectives show what (Pro), or just flip a switch once to effect change everywhere. The release notes lately are packed full of things, but pay special attention to External Resource Folders. If you keep your templates or stencils in a particular spot, point OmniGraffle in the right direction: Graffle will keep your Resource Browser updated. And if you have a new Macbook or Macbook Pro, Haptic Feedback lets you feel when objects align. We’re looking forward to iPad Pro shipping in November. We’ve already submitted updates to all of our apps to make sure they work well on the larger screen size, both when using the app standalone and when sharing the screen with another app. We’ve also added a bunch of great keyboard shortcuts for use on the new Apple Keyboard. And on OmniGraffle there’s something really cool designed for Apple Pencil—shape recognition. 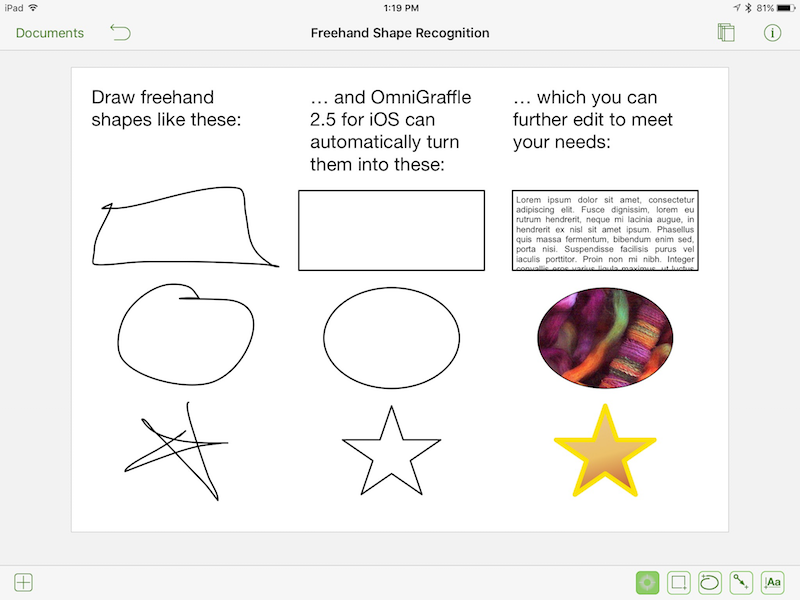 Sketch a freehand shape with your finger or Apple Pencil and OmniGraffle will turn it into a great-looking shape. Perfect for prototyping fast. Finally, as we’re finishing up work on iCloud Drive support (and external document providers like Box), let us know how it’s been working for you with a quick email!